Posted by Hillary Zhang on 2/28/2019 4:58:36 PM. Google Play Books is an ebook digital distribution service, which offers over five million titles, including eBooks and audiobooks. Books can be read on a dedicated Books section on the Google Play website, through the use of a mobile app available for Android and iOS, through the use of select e-readers that offer support for Adobe Digital Editions, through a web browser and reading via Google Home. And in this tutorial guide we are going to show you how to read Google Play Books on Kindle/Kobo/Nook. 1. Open the Google Play Books website. Go to https://play.google.com/books in your computer's web browser. This will open a list of books which you own on Google Play if you're logged in. 2. Go to My books on the left side of the page to find your books. 3. Download the book. Click the three dots icon in the lower-right corner of a book and choose either Download EPUB or Download PDF in the drop-down menu. However, both the PDF and the EPUB option result in an ACSM file being downloaded. Note: Samples cannot be downloaded to desktop. 4. Open the ACSM file with Adobe Digital Editions. Since both the PDF and the EPUB option result in an ACSM file being downloaded, you'll need to turn the ACSM file into a readable EPUB/PDF using Adobe Digital Editions. 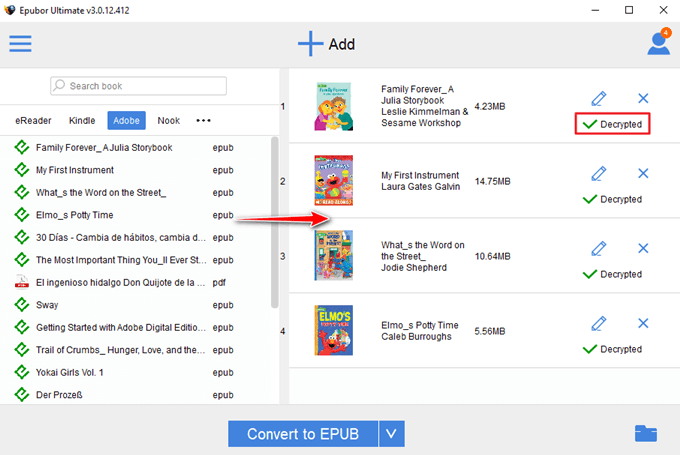 And here's the detailed guide about how to convert ACSM to EPUB/PDF. Note: In order to transfer Google Play books to Kobo/Nook ereader, please make sure to create an Adobe ID with the same email you used to register Kobo/Nook. You can read books from Google Play on most e-readers except Amazon Kindle devices. You’ll need to download them to your computer and transfer them to the e-reader. To do this, download the Adobe Digital Editions app. Note: Your purchased e-book can only be associated with a single Adobe ID. 1. 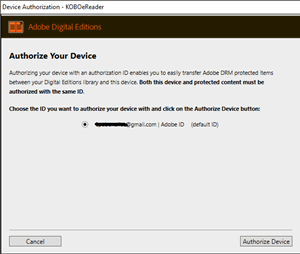 Authorize your computer and eReader with ADE. 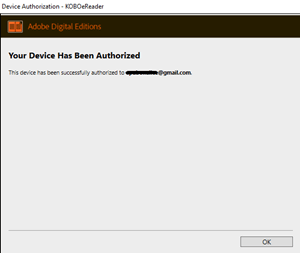 After downloading the ACSM file, then create an Adobe ID with the same email you used to register Kobo/Nook to authorize computer. Or you can't transfer Google Play book to your ereader. Plug in your Kobo/Nook ereader with USB. And your ereader will be displayed in the left side page when you run ADE. First, click the device, then click the gear icon to select authorize device. Then click Authorize Device and OK to complete the authorization. 2. Copy Google Play Books to Kobo/Nook ereader. Click All Items to find the Google Play Book you want to transfer to Kobo/Nook device. Then right click the book cover >> Copy to Computer/Device >> Ereader to transfer the book to your Kobo/Nook device. Eject your eReader from the computer, Google Play book will appear in your Library. 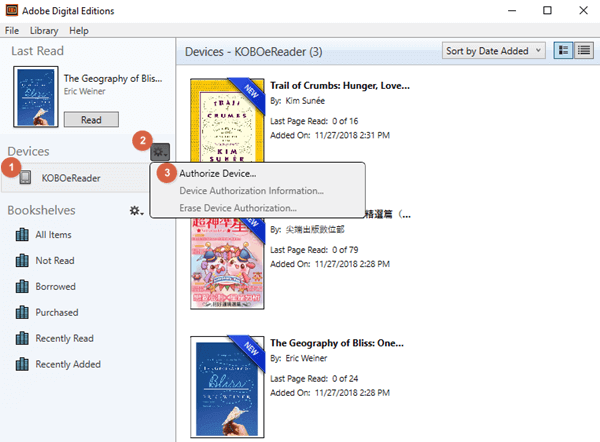 If you don’t want to create an Adobe ID with the email you used to register Kobo/Nook or you think this method is too troublesome, or if you want to decrypt Google Play book directly, then here’s another method to read Google Play Book on Kobo/Nook. 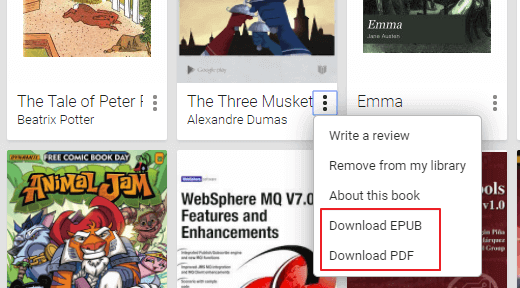 Becuase Google Play Books are available in PDF and EPUB formats, so you just need to transfer the DRM free books to Kobo/Nook reader after decrypting Google Play Books. Since you can't read books from Google Play on Amazon Kindle devices, so we need an eBook DRM Removal and eBook Converter to help us make it happen. As for as I can know, Epubor Ultimate software is the perfect all-in-one ebook decryption tool, which is famous for removing Amazon/Kobo/Nook/Adobe DRM with the highest quality as well as converting ebook format with the fastest speed. Step 1, download Google Play Book with ADE. Step 2, download Epubor Ultimate to your computer and launch it. Note: One cool thing about Epubor Ultimate is that it can automatically detect your downloaded Google Play books in the left sidebar under Adobe column. Step 3, add the Google Play books from the left side-bar to the right main window to remove DRM. 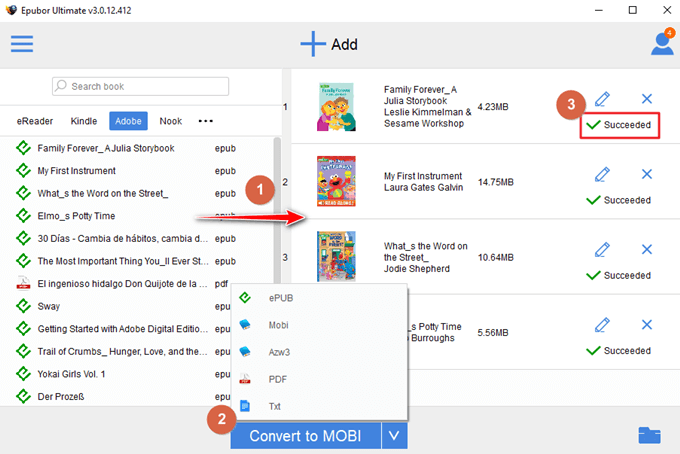 Step 4, choose AZW3/Mobi as the output format and click Convert to AZW3/Mobi to start the conversion. And click Succeeded to find the converted book. 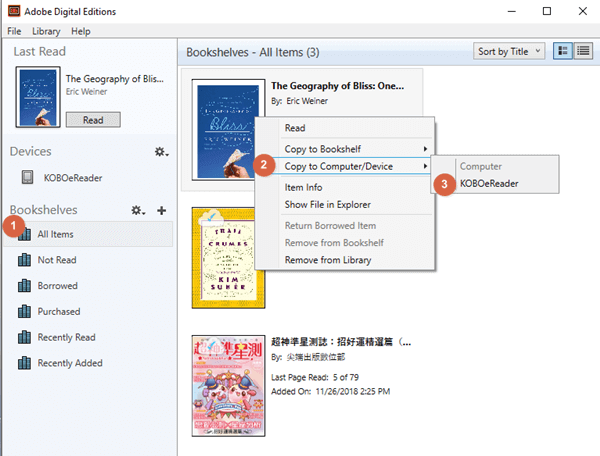 Step 5, plug in Kindle ereader to your computer, then transfer the converted Google Play books to your Kindle device. With the above methods, you can read Google Play Books on any eReader freely. And Epubor Ultimate is a terrific tool to help you unlock DRM-protected eBooks as well as convert book format efficiently.